The inMotion Network Reconditioning offers extensive customized programs ranging from standard to multi-disciplinary reconditioning customized to patient, employer and case manager/insurer needs. Each program is structured and tailored to achieve the goals as determined by all stakeholders and ultimately return to safe function. The inMotion Network Reconditioning Program offers choice and options to insurers and case managers. Once authorization for reconditioning has been received from the referral source, an initial discovery assessment in conjunction with direct communication with case managers/referral source will determine the best programming for the client member/patient. Reconditioning will then be initiated and the client member/patient will engage in one of three options including standard reconditioning, comprehensive reconditioning involving expanded program add-on options at any point during the reconditioning process or a multi-disciplinary program involving psychology and physician intervention. Please refer to the “implementation flowchart” for visual clarification of the overall process. The referring source is asked to supply pertinent medical information on the patient at the time of referral. Each patient/client will be assessed by an experienced physiotherapist and kinesiologist and suitability for the program determined. If the patient is deemed suitable for the program, the patient will be obligated under a contractual agreement to participate in the program. As noted above, client member/patient will be directed into the most appropriate program based on the needs of all stakeholders. Upon completion of the assessment and review of pertinent medical information and consideration of applicable work demands, program goals will be identified in conjunction with the patient. A customized reconditioning program will then be developed by the assessing physiotherapist. A kinesiologist or physiotherapist will be assigned to implement the program on a daily basis if appropriate or on a reduced schedule. Other professionals including physician, psychologist, dietician and occupational therapist may be involved at any time during the comprehensive reconditioning or multi-disciplinary programs. Standard reconditioning consists of a daily program ranging from 4-8 weeks with options of expansion or retraction in time and frequency of program implementation. One to one therapist to patient care or small group (2-3 patient/clients) especially for individuals identified as excelling in small groups offering an environment of group dynamics. Weekly goal setting with RTW goals discussed in the initial discovery assessment and throughout the program. Focused on work simulation and functional exercising to address job demands. Customized exercises prepared on Physio-tec software with video capability for home programming. Focused on reducing Risk and improving Tolerance. Standard reconditioning as noted above with a variety of optional additional services and programs. Add-on optional services will be determined in consultation with referral source following the initial discovery assessment, at the time of referral or at any time during the reconditioning process. Tailored to specific patient needs and can be modified at any time with the inclusion of program add-ons or the removal of same if deemed unnecessary as the program progresses. Fees will be adjusted accordingly with the addition or removal of add-on services and confirmed with the referral source. An extensive return to work (RTW) program for individuals medically ready for administrative / sedentary work, but secondary factors (cognitive endurance, fatigue, anxiety, positional tolerances, ergonomic concerns) pose significant barriers for a successful RTW. Occupational therapist to be involved to facilitate weekly in-clinic meetings with physiotherapist and kinesiologist for program review and revision as needed. Typically a 6-10 week program. Goal setting established and reviewed weekly with patient. Return to work planning and modifications as needed as patient/client is re-introduced to work. Indicated when patient/client is medically fit, but expresses concerns they are not ready for RTW due to cognitive concerns (memory, concentration, organizational issues). Indicated when the job has a high degree of multitasking, responsibility and/or high work place demands. Typically a ten week program offering weekly one hour educational meetings with patient/client to build confidence for RTW. Addresses risk factors for pain disability and is conducted with individuals approaching RTW. Indicated when medically ready for RTW, but psychological and/or pain barriers exists. Administered by an occupational therapist. Typically added mid to late program when RTW planning identifies challenges with determining current patient/client functional abilities in relation to work demands. 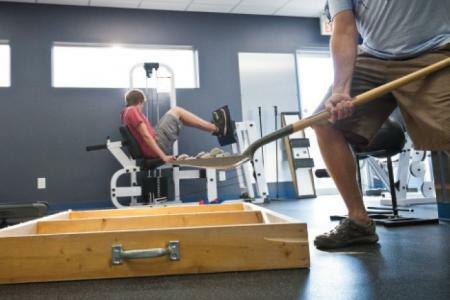 1 or 2 day functional assessment to determine patient/client ability to perform work activities. Standardized reliable assessment tests will validate current level of function in relation to work demands and physical requirements. Typically added mid to late program when RTW planning identifies challenges with determining current level of client member/patient. cognitive as well as physical abilities in relation to work demands. Often recommended and suitable for client member/patient. with brain injury, depression or other long term cognitive disorders. Applicable where there is a question of client member/patient ability and tolerance to perform cognitive components of job duties. Worksite analysis identifying situations predisposing worker to potential injury. Applicable when there is concern of repetitive strain injury and other injuries related to the interaction of the worker and work environment. Recommendations provided for ergonomic equipment or modifications and changes to the work environment to reduce injury risk factors. An extensive evaluation of the clients/patients’ work environment and the physical demands required to perform the specific job and work tasks. A detailed report may include videotaping, observation and determination of quantifiable forces necessary to perform specific job tasks. Often added mid program or after the initial discovery assessment if a JDA is not currently available or it is unclear as to work demands. Individual active aquatic exercise in conjunction with reconditioning or as a separate intervention. Often used in complicated injuries where the buoyant water environment offers sense of “weight relief” and assists with building confidence to move. Often applicable with post-surgical and chronic pain individuals or those requiring functional strengthening and range improvement. Must be capable of walking up two flights of stairs to access the in-house pool. Functional Work Simulation is an essential component for individual’s preparing to return to work. Work Hardening up to 6 hours in duration is available at the Physiotherapy Works! location. 60-90 minute consultations with a registered dietician. Suitable of client member/patient. with an unhealthy BMI and poor dietary habits as determined in the initial discovery assessment. Introduced at the start of the program and number of sessions determined during the assessment. Consultation to include review of diet, meal planning, dietary education, weight loss or gain. Will include initial and discharge report. The multi-disciplinary program will provide a platform for psychological counselling and intervention as well as physician consultation and guidance when challenging conditions or cases present. Decision to enter into multi-disciplinary program will be determined after review of medical information, the initial discovery assessment and consultation with the referring source. Tailored to specific patient needs and can be modified at any time with the inclusion or removal of program add-ons as the program progresses. A physician with experience in occupational medicine and independent medical examinations will be consulted. Often utilized when hurdles to RTW present, delays or regression in progress present, pain management issues escalate, review of medical diagnoses is required and to provide an opinion on alternate treatment options if needed. To address any serious patient concerns and to provide an independent opinion to ensure program appropriateness and continuation or cessation if warranted. Also indicated for client member/patient chart and medical information review and opinion only. Inclusion in the program from start to finish with an initial assessment, mid-program consultation (optional) and at the time of program conclusion. As needed throughout any part of the reconditioning program. Patients/clients will meet with a clinical psychologist to determine degree of service ranging from an initial consultation to weekly intervention. Timely reports will be provided. Typically utilized when psychosocial issues are suspected in contributing to reduced functional abilities.